Our English program focuses on teaching adult students essential communication skills for their daily lives. The program is designed to be practical and help adult immigrants of all nationalities adjust to living in the United States. The schedule and curriculum, which changes each session, allow students to enroll quickly and attend multiple sessions in each level of English before advancing to the next. We teach three levels of English ranging from beginning English literacy to an intermediate level of English conversation and grammar: ESL Readiness, ESL Level 1, ESL Level 2. Classes meet M/W/F, 9:00 a.m. – 11:00 a.m. Fee: $35. Many immigrants are eligible to become citizens of the United States, and therefore, need to learn the history and civics of this country. 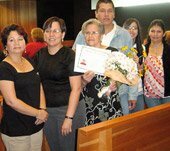 Our convenient schedule and proven curriculum help prepare community members to successfully pass the citizenship exam. This class uses materials provided by the Department of Homeland Security, as well as other resources, to help students navigate current citizenship application and interview requirements. The course also covers the birth of our nation, the branches of government, the Declaration of Independence, the Constitution, and the Bill of Rights. Class meets Saturday, 10:00 a.m. – 1:00 p.m. Fee: $35. The practical nature of the class, along with the combined technology and language skills approach, makes it especially useful for adult learners. Class meets Saturday, 10:00 a.m. – 1:00 p.m. Fee: $35. Need help preparing for the Oregon Driver License exam? This class is for you. 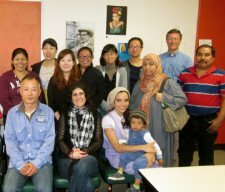 The class is taught primarily in English by a certified ESL instructor. Students are asked to bring the Oregon Driver’s Manual in the language in which they intend to take the test. Class meets Tuesday, 10:00 a.m. to noon. Suggested donation: $10. 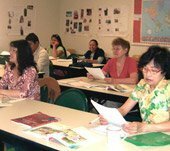 Adult Basic Education in Spanish / Primaria y secundaria en español This course is designed for native Spanish speakers who have little or no primary education. Students develop reading, writing, basic math, and other fundamental learning skills in a supportive, engaging environment. Students quickly gain confidence and improve their skills sufficient to enter a program to earn their primary and secondary diplomas. Plaza Comunitaria Downtown Languages is the official Lane County site for the Plaza Comunitaria, an extension of the Mexican public education system that offers students the opportunity to obtain their official primary or secondary diploma through Internet-based study modules. Although the Plaza is set up as an independent-study program, Downtown Languages provides instructors to mentor students as they work their way through the program. Students develop traditional and computer literacy as they work at their own pace in Spanish to earn their Mexican diplomas. Students who earn a secondary diploma through the Plaza are well prepared to begin a GED program. GED Readiness This class helps native Spanish speakers refresh or acquire the math, reading, and writing skills needed to enroll in General Educational Development (GED) classes. The class is taught by a bilingual educator who provides individualized attention to the students. These classes meet Saturday, 4:00 p.m. – 7:00 p.m. Fee: FREE.